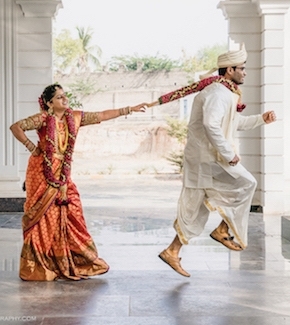 According to Hindu Mythology, maang tikka represents the third eye of the bride and it’s believed to give the bride, the power, wisdom and the will to make the marriage work right. 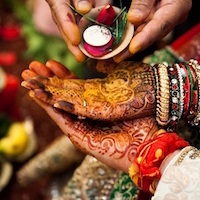 A significance of the union between the bride and the groom. This head jewellery is meant to protect the bride from the evil spirits and energy. A perfect way, to wear this understated yet content to tradition, for the minimalist bride. This double-string or multi-string maang tikka is slightly more magnificent than the single string tikka. This tikka sits across the bride’s forehead giving her the regal look. Usually worn higher than the usual style, this matha-patti mounts the bride’s face and draws attention to her facial features, by just kissing the hairline. Multiple sting Matha Patti has always been favourite among the brides as it’s a statement piece of jewellery drawing attention to its elegant design as well as the bride’s. This type of tikka encircles the crown area of the bride. For the brides with a smaller face or close features, this type of maang tikka is the best to opt for. Another statement piece which gives the bride a dramatic, bold statement and giving her a distinct look on her wedding day. An elaborate matha-patti among the 15 Best Ways to Wear Maang Tikkas and Jhoomars, is the perfect complement to a strong and unique personality. This heavily designed matha-patti with such detailing will be a true allurement to the eyes! For the brides who want to keep their look simple, this beautiful maang-tikka work wonders. You can simply wear it with a middle partition of your hairs or make it a hidden maang-tikka style by concealing the chain of the maang-tikka under your hairs. A traditional South-Indian maatha-patti and simple maang tikka are intricate and elaborate, studded with pearls and other gemstones. It’s a multi-tiered maatha-patti, covering your forehead to the crown of your head, giving a “Royal look” to the bride as the bride wearing this won’t look less than a queen! 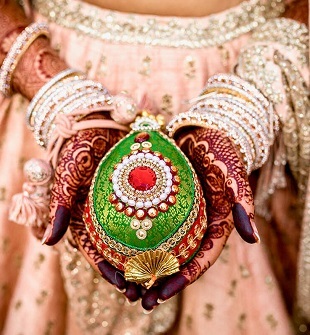 This traditional ornament is worn by the brides of Rajasthan and Haryana, whose name is derived from the jujube fruit commonly known as “ber” or “bor” in Hindi due to its similar shape. The spherical shape of this borla is crafted with either pearls, or ruby or any other crystal. A classic design which is popular among the brides for several years. The typical feature of this magnificent, over-sized tikka is the beautiful pearls and the polki which enhances the overall look of the bride. A Muslim’s bride traditional ornament, usually worn on the left-side of the head along with a maang-tikka, lifting-up their look to royalty. A little dramatic yet bringing out the ultra-chic look in the bride, which sits on her crown area giving her a princess-look! This queenly maang-tikka is inspired by the Mughal era, which has an intricate design studded with pearls and polki beads and other crystals.